Coorg is a land of the generals and beautiful women. Coorgs or Kodavas as they are locally known, are the only race in India who are exempt from the Indian Arms Act and are permitted to possess guns without license. Their customs are unique. Though Coorgs are Hindus, priests do not perform their marriage rites. These fair complexioned men and women with distinctly long noses belong to a martial race. Though they do not belong to mainstream Hinduism, the Coorgs are Kshatriyas (warrior class), according to renowned sociologist Dr M.N. Srinivas. “Coorgs being a hardy race of highlanders are given to bodily skills of dancing and other competitive games like hunting, shooting, etc., which are attributed to the Kshatriyas,” says Dr Srinivas who has done extensive research on the Coorgs’ way of life. The customs of Coorgs are different from that of other south Indians. When a son is born in a family, a single shot is fired in the air to greet the newcomer. Similarly, when a Coorg dies, two simultaneous shots are fired in the air to alert the neighbours. Coorgs are legendary for their hospitality. Pork, cooked with vinegar derived from wild berries, is a delicacy served at important feasts. The Coorgs worship guns. The festival of Keil Murtha, is solely dedicated to the worship of guns. The harvest festival of Puttari is ushered in by firing a gunshot. Though Coorgs are distinct from other south Indians, they speak a Dravidian dialect, which is mixture of Kannada, Tamil and Malayalam languages. Coorgs are free from the caste system. Despite being Hindus, ancestor worship called “Karana”, takes precedence over the worship of other Gods in the Hindu pantheon. Coorgs are nature worshippers and they revere river Cauvery. It is their holy river, as river Ganga is to other Hindus. Coorgs get themselves blessed by touching the feet of their elders thrice. The ceremonial dress of Coorgs is unique in south India. Men wear long knee-length black coat with sleeves cut short at the elbow; a scarlet and gold sash; silver-sheathed ornate dagger; gilted turban. The women wear their sari in a different way by tucking the pleats at the back, unlike the typical Indian way of pleats being tucked in the front. Coorg weddings are something out of this world. The bridegroom claims his bride after a member of his party “kills” mock soldiers in the form of banana trunks. After a sumptuous meal, the Coorg men and women burn their calorie by performing vibrant traditional dance. But who are these Coorgs? This is a standing riddle which the ethnologists are yet to crack. There are any number of theories on their origin, but none scientific enough to establish the origin of this fine race. The theories range from Coorgs being the descendants of Alexander the Great who invaded India to a band of Kurds from the Iraq region who fled to India to escape conversion into Islam. But there is something extraordinary about these people who gave free India its first Commander-in-Chief of the Army Field Marshal K.M. Cariappa and the soldier’ s general K.S. Thimmayya. 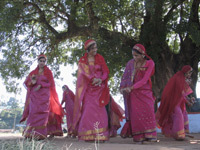 Coorg women occupy a predominant place in the community. Among these highly educated women, there is no dowry system, unlike other Indian communities.